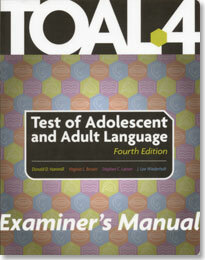 The updated TOAL-4 assesses spoken and written language in the ways adolescents and young adults actually use those skills. This new edition, with six subtests instead of eight, takes less time than previous editions and was normed on a nationally representative sample. Examinees provide oral responses for Word Opposites, Word Derivations, and Analogies. Three tasks require written responses: Word Similarities (synonyms), Sentence Combining (create one grammatically correct sentence from two or more incorrect sentences), and Orthographic Usage (punctuation). The TOAL-4 can be administered in about 60 minutes. Individual subtest scores are combined to give three composites: Spoken Language, Written Language, and General (overall) Language. Results are reported as scaled scores, standard scores and percentile ranks.